The acrylic marble plaque plate was reverse engraved on the back side of the plate. Using a 35 watt laser, a speed of 100 and power of 22 produced a crisp, white engraving. For areas with larger fills like logos, adjust the focus .020 inch out of focus. 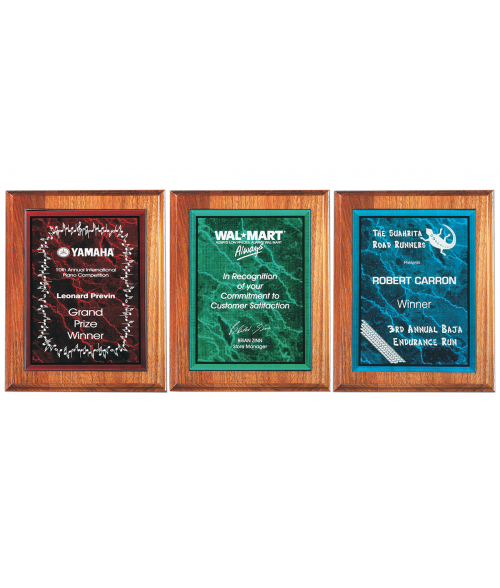 A larger spot size will be created to reduce raster lines in the engraving. Apply the plate to a Wood Plaque using the double stick tape included. PLEASE NOTE: Wood Plaque sold separately. Available in red, blue and green.